Liz studied music at University College Cork and graduated with a Bachelor of Music degree and a Higher Diploma in Education. Yvonne moved to Galway and began playing music fulltime. After finishing in Cork, Liz returned to Galway and they both shared a house with musician, Sharon Shannon. The following year, they joined her band as part of 'Sharon Shannon and The Woodchoppers'. For the next three years, the band took them all over the world to promote the release of the album 'The Diamond Mountain Sessions'. Perhaps the most musically important track is “Saints and Angels” written by chief Waterboy Mike Scott. This track was written for their Fisherman’s Blues album (but was never included on the album). The new recording features the first ever reunion of that classic 1989 line-up that includes Mike, Steve Wwickham, Anthony Thistlethwaite and Sharon. The instrumentation is largely made up from Sharon’s touring band, which includes drums, bass, Hammond organ, electric guitars, sax and provides a muscular rhythm to Sharon’s accordion, fiddle and whistle playing. 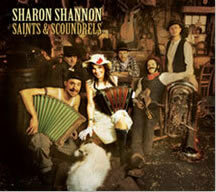 Once again the variety and talent of the guests who contribute on Sharon’s Saints & Scoundrels new release serves to highlight her musical versatility, wide appeal and huge respect from within the musical community.